Riko and Reg’s first hours in the Forest of Temptation go easily enough—even the giant leaves point them in the right direction. But we knew the silkfang wasn’t going to be the only man-eating beast they encountered, and sure enough, rushing in the direction of what they think is a man yelling “help me” turns out to be the luring call of a corpse-weeper, who snatches up Riko with the intent to feed her to her young. Reg’s extending arm’s aim is true, but other weepers knock it off course. 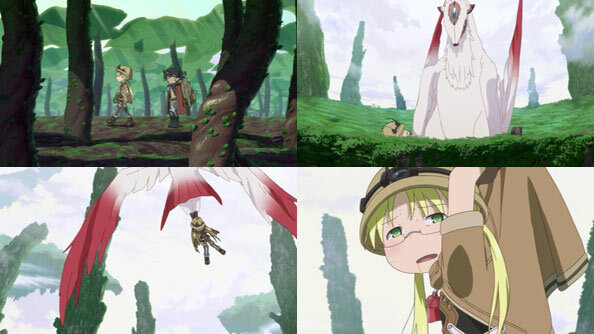 In addition to being torn apart and eaten, ascending worsens the Curse and puts extra strain on Riko, who vomits in midair before passing out. Even though I knew there was no way she’d buy it here, my heart was still in the pit of my stomach. When Reg’s arm doesn’t work and he’s swarmed by weepers, he changes tactics, firing his hand cannon at the weeper nest and obliterating all the weepers, including the one carrying Riko. He then catches her in mid-air with his arm, gathers her into his arms, and soft-lands on an itty-bitty column of rock. Whew, that was close. but it’s also telling. Things are not going to get easier from this point on! It’s a dangerous place. Here, all humans (or robots that look like humans) are prey. Riko is tough-as-nails, and doesn’t even mind that Reg took her top off (to check her for injuries) when she was out; because she knows full well that like any other ordinary human Red Whistle (or even above), she’d be silkfang, or weeper food, or simply a dark red spot on some rock face, without Reg’s help. She calls his beam weapon “Incinerator” (even though he’s still weary of accidentally hitting her with it), and makes a meal of the meat from the weepers he killed. While the weepers eat the flesh of men, Riko doesn’t consider it any different than the times cave raiders brought Abyss meat to the orphanage. It’s just the Circle of Life, baby. Another realistic detail about their quest for which I’m thankful so far is that Riko keeps losing things: first her seemingly useless (but probably not) Star Compass, and most recently her book of field notes, which she did not memorize. In both cases, they can’t risk trying to search for or retrieve such things; they can only press on. And press on they do, to the bottom edge of the Second Layer, the Inverted Forest. I’ve been looking forward to them reaching this place ever since we got a glimpse of it in the OP (and since Sigy described it on the map). It does not disappoint, as it is not only a stranger and more fantastical landscape; it’s also darker, colder, more foreboding and treacherous. The waterfalls going up are also a nice touch. Just as Riko is losing things, Reg’s foolproof extending arm is getting more and more flummoxed; first by the weepers, and here with the intermittent strong winds. They also run afoul of a colony of ape-like Inbyos, who are not interested in interlopers in their territory. 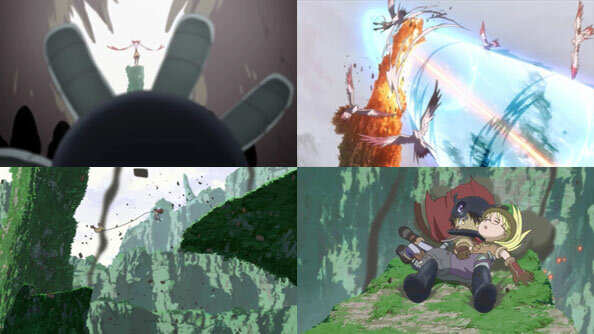 So Reg has to get used to his arm’s more limited effectiveness while getting himself and Riko away from violent primates. But even here, there is some small relief: the same reason it’s dark and cold is the reason most of the fauna is relatively peaceful, while the effects of the Curse are diminished (or at least more bearable) around the Seeker Camp, which they eventually arrive at. When they don’t see a lookout and no gondola descends, Reg does what he does, using his arm to ascend to the camp. 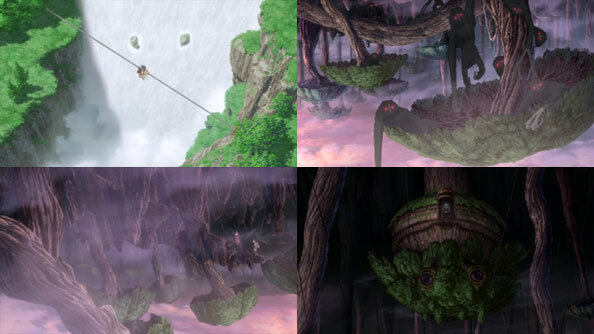 But something else unexpected happens: his arms don’t grasp any rock or wood: they are grabbed and held by the person Habo warned them of; the one who helped Lyza carry baby Riko back to the surface; who notes the “brat” is still alive. 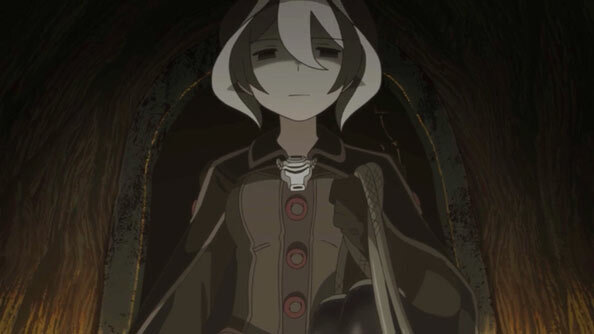 She’s the one they call The Unmovable Sovereign: Ozen. Will she be a source of hope or despair for our adventurers?